Winter returned to us in March, after an incredibly warm and dry February. But alas, spring is inevitable, and all critters, humans included, emerge from their caves in April looking for adventure! If you are a rookie like us, don’t be intimidated by the bike jocks that invade this route; despite our commuter bikes and ragtag appearances, they were actually quite congenial. I even overheard one remark to another as they whizzed past us, “I really admire people who ride bikes like that “! For ride suggestions, the Alta Alpina cycling club has a great website (insert link). 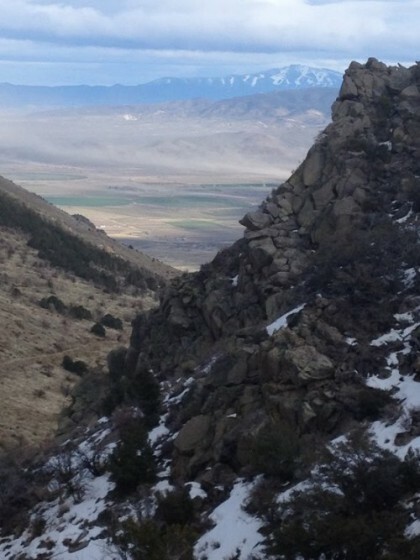 If you’re more interested in keeping your feet on the ground, there are plenty of fantastic hikes in the Carson Valley. 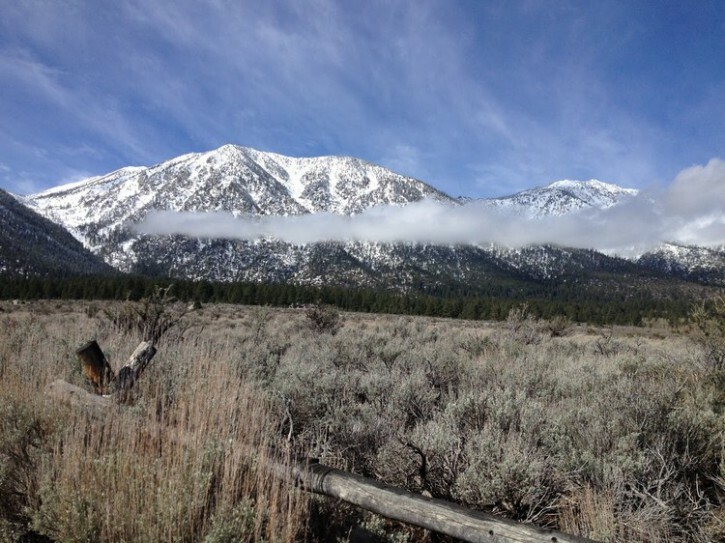 For easily accessible, well-groomed and moderately well-traveled trails, see the CVTA website and previous Carson Valley Correspondence. Or for a uniquely Nevada-style adventure, step out of your comfort zone and go “outbacking.” Rickey Canyon can be accessed from Upper Colony Road in Smith Valley, NV. 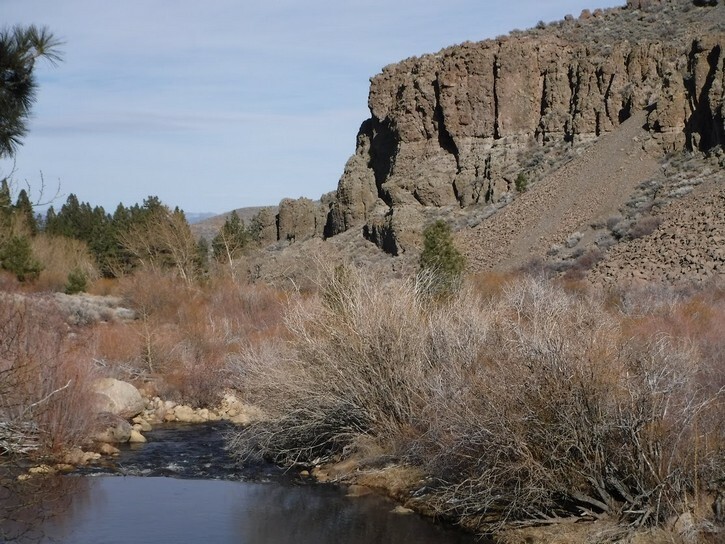 This well-marked BLM access point leads into the Burbank Canyon Wilderness Study Area, with fantastic views of rocky cliffs and distant mountain ranges (the Wassuk Range and beyond, the Sweetwaters, and the Eastern Sierra. Although much of the area has been burned in recent fires, there are vast slopes of beautiful well-established bunch grasses and pockets of enormous decadent mountain mahogany. We encountered not another soul on our seven hour journey, and it was evident from the condition of the road that it had not been used by humans for months (only critter tracks marred the snow cover). On the way up Rickey Canyon, we were treated to an ungulate sighting (group of pronghorn antelope? ), and five miles in, to breathtaking vistas of Topaz Lake, the East Walker River and the Sierra. The elevation gain makes this a tough and chilly trek, so bring a lunch, water and a coat and hat! And if you want to be able to walk the next day, be prepared to take some rest stops (ouch!). 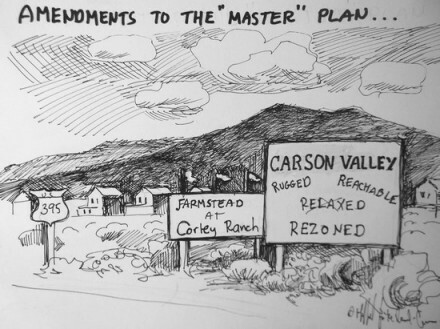 The Carson Valley Visitor’s Authority website cannot be beat as a reference to local happenings catering to a variety of tastes and preferences, but I’ll highlight my favorites here. The Carson Valley Arts Council (CVAC) hosts a screamin’ series of art exhibits and concerts at the Copeland Gallery and CVIC Hall. This month’s trio of artists, Carolyn Denning, Cheyenne McAfee and NancyRaven, present an eclectic and imaginative grouping of art ranging from tinwork to pinhole photography. The CVAC concert offering this month is Run Boy Run, whose tunes range from lyrical to joyful and even raucous, playing April 22 at the CVIC Hall in Minden. Country music singer and wild horse advocate Lacy J. Dalton will be performing at the Carson Valley Inn April 8 at 7 pm, and there is a huge lineup of performers slated for the Genoa Cowboy Festival April 28-May 1.